The rift with the West and the subsequent sanctions imposed in 2014 have not substantively impacted Moscow’s leading position as a seller of arms. 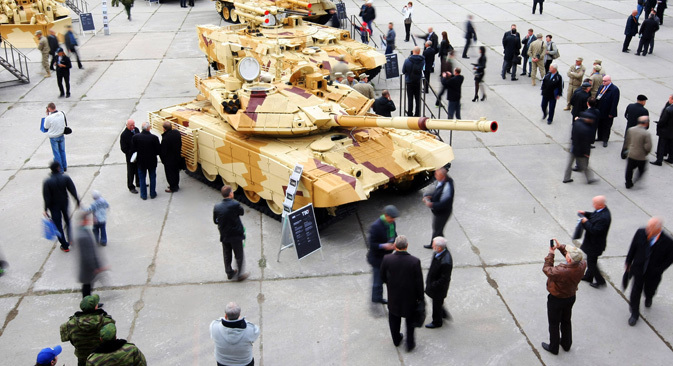 Amid increased competition, Russia’s armament industry is consolidating its presence in India and is looking for new markets in the Latin American, African, and Southeast Asian countries. Russia sold weapons worth $10 billion in 2014, a 9% increase over the preceding year, says IHS Jane’s Annual Defence Budgets Review. However, Rosoboronexport says that in 2014 Russian arms exports were $3 billion higher than the figure published by IHS Jane’s. Against the background of what the United States achieved during this period, even this figure loses its impressiveness. In 2014, US arms manufacturers sold weapons worth $23.7 billion, racking up a 19% growth over the previous year. In other words, even if we make an adjustment, in terms of absolute value ​​(American weapons being more expensive), the growth of US sales dynamics are almost two times higher than that of Russia’s. What is the reason for this growth in US arms sales? The answer is simple – the instability in the Middle East. Here, over the years that the US had been the dominant power in world politics, the Americans succeeded in significantly strengthening their position, and their allies experienced all the delights that high oil prices could bring to their lives. The allies that Russia inherited from the Soviet Union (such as Syria and Iraq) find themselves under sanctions and fighting civil wars. In these conditions, US defence companies are free to take full advantage of the situation of the instability created by their government in the Middle East. As a result, just in this market, in 2014, the US weapons sales surpassed those of Russia by several times – $8.4 billion versus $1.5 billion (Russia was behind even the UK in sales, and only slightly ahead of France). Russia’s client, for example, is the civil war-torn Syria. This is in stark contrast to the key military partner of the US in the region – Saudi Arabia, which according to IHS Jane’s, became the most lavish buyer of weapons in 2014, spending $6.4 billion, with plans to increase this amount by 50% in 2015. These record purchases by Saudi Arabia have allowed it to move ahead of the traditionally largest arms importer – India. And this leads us to a discussion about the situation in the main markets for Russia. Last year, the Russian defense industries sold the most products to China – $2.3 billion, followed by India with $1.7 billion, and Vietnam and Venezuela at $1 billion each. The future prospects of these markets raise a number of questions. “We forecast a drop in exports due to the fact that many weapons purchasing programs have been completed, and this trend will be reinforced by the sanctions,” Jane has noted in its analytical report. India, which has a number of joint-projects with Russia, such as the development of the BrahMos and the creation of a fifth generation fighter FGFA, is nevertheless increasingly looking towards the West, expanding cooperation with Israel, the US, and the EU. This trend was clearly manifested during the recent visit of US President Barack Obama to this country. This strategy allows India, which has proclaimed a policy of “Make in India”, to obtain more advanced technologies and diversify its imports. In addition, cooperation with India is hard to reconcile with the development of Russia’s relations with China. Thus, the decision to supply S-400 air defence systems to China elicited an extremely painful reaction from Russia’s Indian partners. As for Venezuela, Iran, and Algeria, their purchasing power, just like in Russia itself, is suffering from falling oil and gas prices. In January, at a meeting of the Military-Technical Cooperation Commission, Russian President Vladimir Putin announced the need to find new markets for Russian weapons in the Latin American, African, and Southeast Asian countries. In Latin America, Russia is working on a variety of projects with Brazil, which is considering purchasing Russian air defence systems and cooperation in the helicopters sphere. Russia is also looking at possibilities of cooperation with Peru, Argentina, and Nicaragua, but most of the rare “rich pickings” of these markets do not go to Moscow. In Africa, the Soviet Union left Russia not only a rich legacy in the form of unpaid debts of the countries in this region, but also in the sphere of military-technical cooperation. However, over the last 20 years, almost all of these communications were lost, and now they need to be rebuilt anew, while competing in this not too rich market with cheap Chinese-made counterparts. Much more promising, in terms of potential profits, are the markets in APR countries. Among the most promising deals here are the current negotiations being held with Indonesia for the supply of Su-35 fighter jets, to replace obsolete American F-5 fighters.